Motion controls for punching, anyone? We've seen plenty of Oculus Rift mods over the past year that attempt to breath new life into retro Nintendo games. Some have been a tad peculiar, while examples such as Metroid Prime suited the virtual reality technology particularly well. 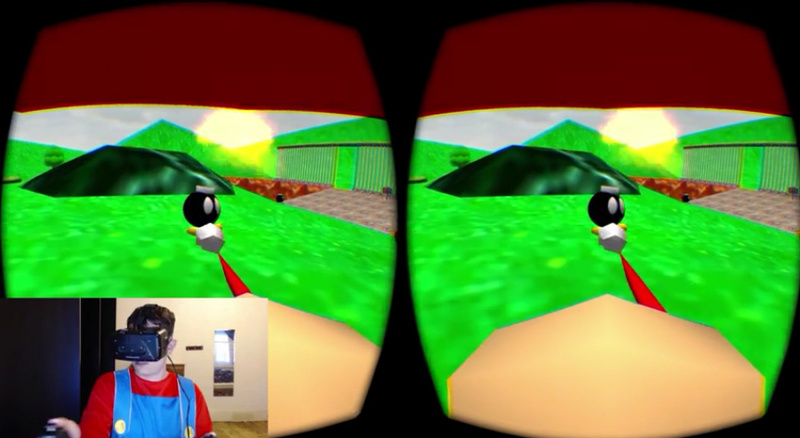 Running a Super Mario 64 mod through the VR headset isn't new, but YouTuber Chris Zaharia is trying to achieve a fully immersive experience by incorporating a motion controller into each hand to simulate Mario's punches. The end result is a rather stilted, slightly peculiar game in which Mario's arms stretch in front of him in an unnatural way; for a fan effort it's relatively impressive, of course. This'll never replace the standard experience, not by a long shot, but it's a good example of what fans can achieve when they put their minds to experiments like these. Check it out and let us know what you think. This is just all kinds of disturbing. Mario looks like he went to the FFVII world to have arm surgery. There are a few things wrong with this. Firstly, his arms... They are so freaky. And the same when you look down at your feet. But also the frame rate looks bad. I am sure others before didn't have this problem. But, to be fair, it's miles better than I could ever do so congratulations to him. Nope, still a huge headache. I didn't know Mario was Mr. Fantastic. Nothing new; Oot, Wind Waker and Metroid Prime have all gotten rift treatment, Mario 64 was an odd choice thought.